BELLEVIEW, Fla. - Every morning three Belleview police officers help the crossing guard at Belleview Elementary get kids safely to school. One of these kids is Mikey Shaver. The three officers saw Mikey every day as he rode his bike to school, smiling, wearing his special mohawk helmet. 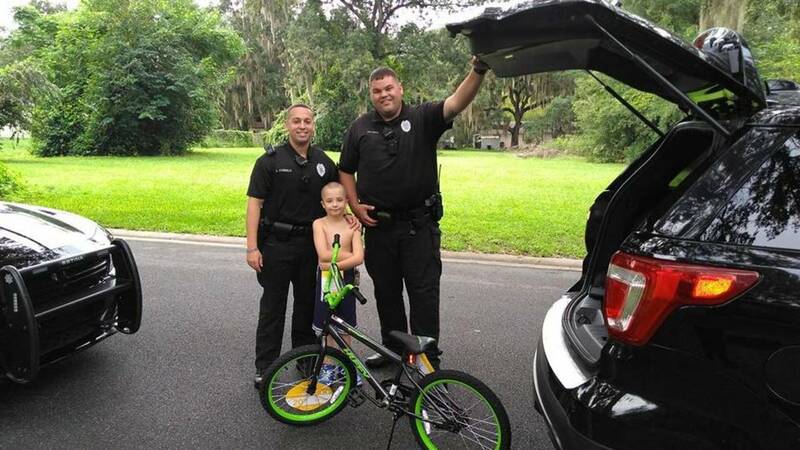 When Mikey's mom, Jen Shaver, told the officers that the boy's bike was stolen off of their porch, the officers knew they wanted to help. Shaver said she had been driving Mikey to school after his bike had been taken. But Friday morning before school, Officer Miley and Officer Curbello provided him an alternate method of transportation. The two officers came right to Mikey's house and surprised him with a brand new bike and bike lock. "I was blown away!" wrote Shaver on Facebook. "It's so awesome to live in a town that has awesome police officers that care! Thank you for everything you do for us, Belleview Police Department."